Inkless Pen Uses Special Metal Alloy To Write… It will NEVER Run Out! Italian car design company, Pininfarina, temporarily stepped out of the automobile sector in order to create a revolutionary writing tool. 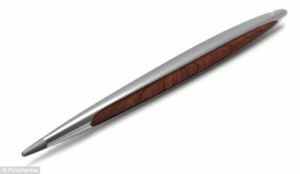 Their new pen/pencil hybrid utilizes a tip consisted of a special alloy instead of ink. No more running out of ink and asking everyone you know for a writing utensil! The pen uses an alloy called ethergraf, which is similar to the tip of pencil, yet doesn’t break, need to be sharpened, or run out. Napkin, an Italian stationary company, came up with the alloy and Pininfarina collaborated with the company in order to create the 4.EVER Pininfarina Camiano. Previous successes for Pininfarina include numerous, iconic Ferrari designs, so to say we are looking for big things in their new pen would be an understatement. And of course, traces of Pininfarina’s knack for designing awesome vehicles can be seen in the design of the 4.EVER, with wood paneling running along the side of the aluminum pen. Supposedly, this awesome product has the precise stroke of a pencil along with the performance of a pen. The public will not have much longer to wait to find out because the 4.EVER Pininfarina Camiano is expected to be launched soon!